This is a throw-it-all-together kind of salad that is perfect for a picnic or a sunny lunch in the garden. Double-podding is better as it keeps the dish fresher and more summery. However, you can get away without doing this if you’re short on time. Simmer the beans in a saucepan of boiling water for 1–2 minutes. Drain and run under cold water, then squeeze them out of their skins. 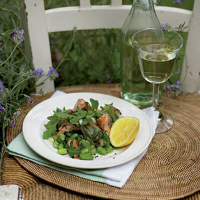 Place in a mixing bowl with the artichoke hearts, salad onions and hot-smoked salmon. Whisk together the olive oil, the lemon juice and the preserved lemon rind. Season with salt and black pepper. Pour this dressing over the beans, add the mint and rocket and toss well. Divide the salad between plates and serve with slices of lemon.